Founded by Claudine Andre in 1994, Lola ya Bonobo is the world's only sanctuary for orphaned bonobos. Since 2002, the sanctuary has been located just south of the suburb of Kimwenza at the Petites Chutes de la Lukaya, Kinshasa, in the Democratic Republic of the Congo. 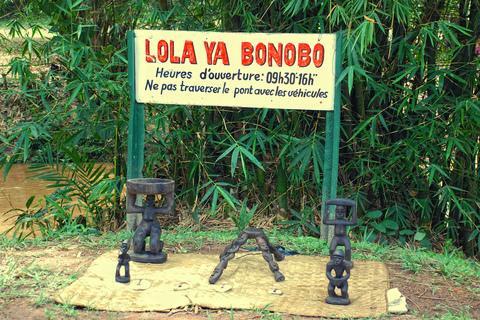 Lola ya Bonobo means 'paradise for bonobos' in Lingala, the main language of Kinshasa. In 2012, Lola ya Bonobo was home to 60 bonobos who live in 30 hectares of primary forest. Typically, bonobos arrive as young infants. The bushmeat trade in Congo sees hundreds of bonobos killed each year for meat and the infants are sold as pets. When confiscated, these infant bonobos are taken to Lola ya Bonobo. They begin life at the sanctuary with close care from a substitute human mother, but are usually quickly ready to be integrated into a peer group, and shortly afterwards into one of the large mixed-age social groups.